Continuing my Star Wars Resume! In the summer of 1981, I discovered Star Wars comic books. Prior to then I’d picked up an issue or two like any kid might have picked up Archie or Sad Sack. When I bought Marvel Comics Star Wars #50 off the shelf, I knew I was buying something different. This wasn’t just some throw away tale for kids, this comic was packed with great storytelling, amazing art, and expanded the Star Wars universe. From that point I stuck with the Marvel series, eventually buying all the issues (some of the harder to find issues I got in trade paperback format). Once the Marvel title ended in 1986 at issue #107, there really wasn’t a Star Wars comic book outlet. I moved on with my comic reading interests, always with a fond memory towards those adventures. Then in late 1991, shortly after the publication of the novel Heir to the Empire, Dark Horse comics obtained the license to produce Star Wars comics. They started with Star Wars: Dark Empire. Wow, what a series! My friends and I nitpicked it, but really we loved the heck out of it. It was an epic tale with amazing art. Some of the plot points still don’t sit well with me, like the cloned Emperor, but I’m willing to forgive that given the importance of this series. This was the first new Star Wars comic in six years and spawned Dark Horse’s Star Wars comic line that remains in publication today. For me personally, I enjoy the comics that take place after A New Hope. My favorites include: the aforementioned Marvel Comics series (specifically issues #49 – 81, set between The Empire Strikes Back and Return of the Jedi), Dark Horse’s Star Wars: Empire & Star Wars: Rebellion (both set between A New Hope and The Empire Strikes Back), Dark Horse’s Classic Star Wars (reprints the old newspaper strips from the early 1980s), and Dark Horse’s current title Star Wars Legacy (takes place 125 years after Return of the Jedi). I now own well over 350 hundred Star Wars comics. Below you’ll see all my Star Wars comics stacked up, along with some of my Expanded Universe action figures. Click the image to enlarge. Luke Skywalker (on the path to the Dark Side), Jedi Leia Organa Solo, and an Imperial Sentinel from the Dark Empire comic series. If you’re interested, click here for a well-organized list of Star Wars comic books on Wikipedia. I’m ecstatic to report that on Sunday night my 10 year old step-son picked up one of my trade paperbacks reprinting the Marvel series and was immediately hooked! He’s blazed through several issues and is devouring them at lightspeed. If you are a fan of the Marvel Star Wars comics, check out the Two True Freaks Star Wars Monthly Monday podcasts. 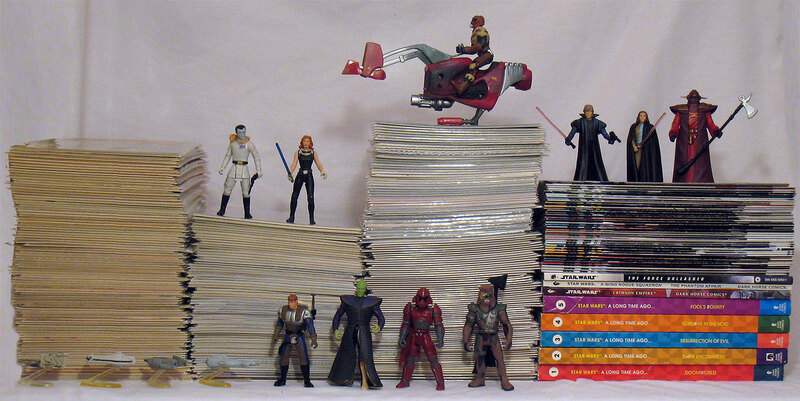 Their mission is to review each and every Marvel Star Wars comic in order. These guys are incredibly knowledgeable in the area of Star Wars and they also know how to bring the funny. Well worth your time. Check back here tomorrow for more of my Star Wars Resume. Clearly no one can doubt your SW fanboy chops, Shag! Tha’s a lot of comics.